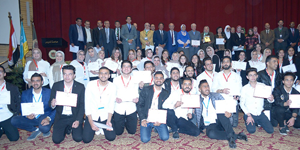 On Tuesday 26/03/2019, the faculty of Mass Communication-Pharos University held the third scientific day for originality and renewal, sponsored by Eng. Alaa Ragab- the Head of the Trustees Council and Prof. Mahmoud Mohy Eldeen- the President of the university supervised by Prof. Fawzy Abd El Ghany- the Dean of Mass Communication Faculty. Abd EL Ghany begun the conference by honoring Prof. Ibrahim Emam as the first dean of the faculty of Mass Communication- Cairo University. Prof. Magy El Halawany- the Ex-Dean of Mass Communication- Cairo University, Mahmoud Alam Eldeen- the Vice President of the scientific committee for promoting the professors of the media and Hassan Emad Mekawy- the Ex-Dean of Mass Communication- Cairo University.